GeoPoll’s Media Measurement Service produces daily ratings and audience size for TV, radio, and print in Kenya, Ghana, Uganda, and Tanzania, so we have been closely following news around the switchover from analogue to digital television transmission in Kenya. This transition, which has already started to occur in the capital city of Nairobi, will mean that by June 2015 all households in Kenya will need a set-top-box to access television stations. Currently, many people in Kenya access TV stations through free-to-air analogue signals, which do not require additional equipment to receive. Digital signals have several benefits to analogue: digital signals provide clearer pictures and sound, a wider selection of channels, and use less bandwidth to transit, which will enable Kenya to use more bandwidth for other services. However, the required set-top boxes are expensive, an average of around 5,000 Kenya shillings, or about $55. To assess the knowledge and perceptions of the switchover, GeoPoll conducted a mobile survey with 400 Kenyans from across the country on January 12, 2014. This sample equals a margin of error of 4.9% at the 95% confidence level. The first set of questions asked about respondents’ knowledge of the switch and benefits of digital. We found that 75% of respondents are aware of the requirement to have all TV signals switched from analogue to digital, and a higher percentage, 88%, know that they will need a set-top box to receive TV stations after the digital transition. In Nairobi, 81% were aware of the requirement to have all TV signals switched. These results could indicate that public messaging has been mixed around the transition: while many are aware they will need a set-top-box, some do not know why it will be required. We also asked where respondents were getting their information regarding the switch, and found that 54% trusted TV as the best source on information. Respondents were asked about the benefits of digital TV transmission, with 72% indicating they are aware of the benefits. In Nairobi, 77% knew of the benefits to digital. Respondents were asked to write in the benefits they knew of, and answers centered around the clarity of pictures and the additional stations they will receive with digital. These benefits align with those promoted by DigitalKenya, the campaign from the Communications Authority of Kenya. GeoPoll also asked questions about access to digital signals, finding that less than half of the sample (45.5%) is currently able to access digital signals. In Nairobi, where most channels have already stopped transmitting analogue signals, 60% of the sample can currently access digital signals. The respondents who indicated they can access digital signal were asked how their TV accesses digital channels, finding that 58% have a pay-TV digital decoder, which has a monthly fee, and 21% have a set-top-box which recieves basic stations for free. In Nairobi, 68% have a Pay-TV digital decoder. Finally, we asked respondents who had not yet made the switch what factors were impacting their switch, finding that the high expense was the most popular response (43%), followed by “don’t know how” (15%). 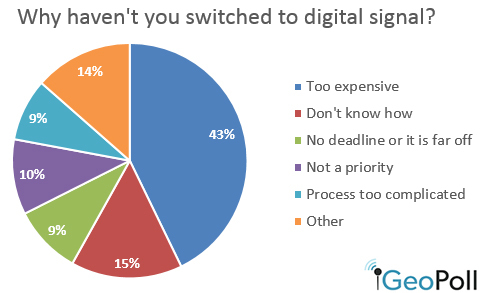 Examining when these respondents were planning to switch from analogue to digital, we found that 29% plan to switch in the next month, and 21% plan to switch in the next two to three months, in line with the government’s deadline of June 2015. However, 18% said they will wait a year to switch, and 14% indicated they would never switch, demonstrating some resistance to the change.